Located on Alcatraz Island in San Francisco Bay, the penitentiary was once home to gangsters and criminals including Al Capone, Alvin ‘Creepy’ Karpis, and George ‘Machine Gun’ Kelly. 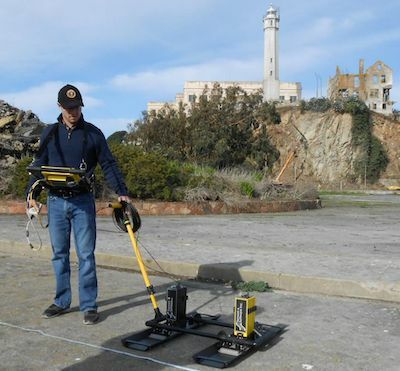 Now, archaeologists have used ground-penetrating radar data and terrestrial laser scans to non-destructively uncover a hidden military traverse underneath the prison. Led by faculty at Binghamton University, State University of New York, the team also made use of georectifications – where old digitised maps are linked to a coordinate system so that they can be accurately geolocated in 3D space – to locate and assess the historical remains. The team’s methods revealed that remnants of buried structures – including a "bombproof" earthwork traverse along with its underlying vaulted brick masonry tunnel and ventilation ducts – ran east to west beneath the prison recreation yard. "The remains of these historical archaeology features were just a few centimetres beneath the surface and they were miraculously and impeccably preserved," said Binghamton University archaeologist Timothy de Smet. "The concrete veneer of the recreation yard floor is incredibly thin and, in fact, in places sitting directly atop the architecture from the 1860s. We also learned that some of the earthwork traverses were covered over with thin concrete layers through time, likely to decrease erosion on the rainy windy island. It was wonderful to find the history just beneath our feet that we can visualise for the public." View the full article on The Engineer.